Daniel Boone - WHO WAS DANIEL BOONE REALLY? On November 2, 1734, Daniel Boone was born in a log cabin near the present town of Reading, Pennsylvania. His parents were English Quakers who had 11 children. Although Daniel became a young woodsman, who kept his family supplied with fresh meat, he could read and write. His favorite book was Gulliver's Travels which may have been an early influence on his sense of adventure. His boyhood home in contemporary Birdsboro, Pennsylvania is still a place where people celebrate his life. When Daniel was sixteen, his family moved south. They settled in the Yadkin River Valley in what is now North Carolina. It was in Carolina where Daniel met his wife, Rebecca Bryan. Rebecca came from a prominent family that was loyal to the British. Two of her uncles were officers of the Loyalist militia in North Carolina. Daniel and Rebecca eventually had ten children. As a woodsman and a hunter, Boone was the perfect choice to lead expeditions into territory unsettled by Americans. In 1769, he and four other explorers entered the "new" land of Kentucky. While Kentucky had not been settled by Americans, it was not "new" land for the Shawnee Indians. In fact, it was sacred territory (follow the link to view original signatures on a 1795 peace treaty) for the Shawnee. In 1775, when Daniel was 41 years old, a Carolina judge (Col. Richard Henderson) hired him to make a road through a pass in the Kentucky mountains. The pass was the Cumberland Gap. Later, a highway marker at the beginning of the Cumberland Gap Trail honored Boone's part in forging the wilderness. 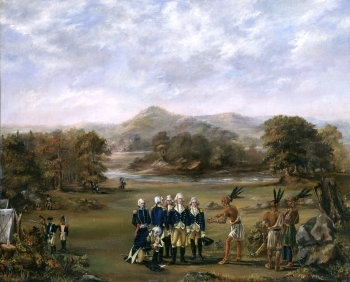 Col. Henderson had purchased some of the Cherokee land in Kentucky. His hope was to establish a new American colony on the land he had purchased. Boone's job was to blaze a trail and, at the end of the 300-mile trail known as the Wilderness Road, the frontiersman established the fort which bore his name: Boonesborough. Living conditions were extremely primitive, as this 1907 photo of Boone's cabin at High Bridge, Kentucky shows. Daniel Boone became famous for all his exploits after an investor in the Kentucky property, John Filson, wrote a book which created a legend. The Adventures of Colonel Daniel Boon, Formerly a Hunter; Containing a Narrative of the Wars of Kentucky gave Daniel Boone an international reputation as a "noble anglo frontiersman." That legend has survived intact to this day. What was never part of the legend was an incident that occurred just outside the fort of Boonesborough in 1778. It was this incident - and its aftermath - that formed the basis of the charges against Boone. Bos, Carole "WHO WAS DANIEL BOONE REALLY?" AwesomeStories.com. Oct 01, 1999. Apr 25, 2019.